This breakfast yogurt parfait is a staple in my house. I literally have been eating this for breakfast for YEARS. It is easy, delicious and packed with nutrients and flavor! 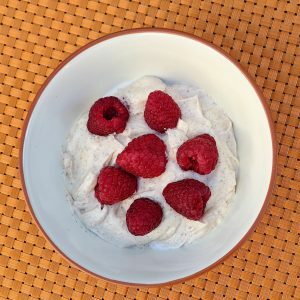 My breakfast yogurt parfait is packed with 26 grams of protein, 9g of fat and 12g of carbs and is gluten-free! Do not be afraid of the fat content as it comes from almond butter and is considered a healthy fat. You can use crunchy or smooth almond butter, frozen or fresh berries. I prefer fresh berries but sometimes I run out and frozen do the trick! Who knows you might even prefer frozen! Either way this recipe is sure to tickle your taste buds! **UPDATE: Someone in the comments below said they loved the recipe and added flaxseed meal. I have now done this and highly suggest it! Adding a tbsp is an easy way to get extra nutrients and doesn’t change the flavor at all! 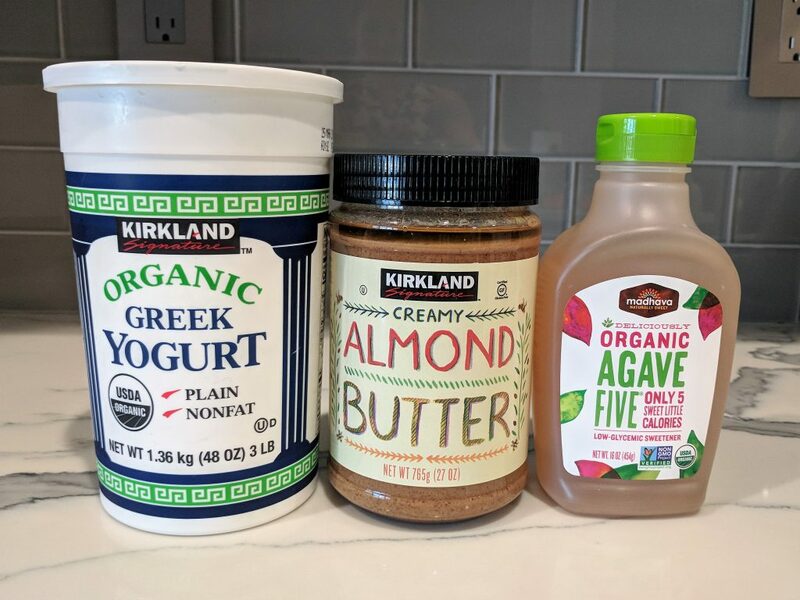 I buy my yogurt, almond butter and berries (fresh & frozen) at Costco and the Agave Five shown below at Sprouts or on Amazon. You can substitute any sweetener for the agave or just leave it out. I use it to take away some of the tartness from the greek yogurt. 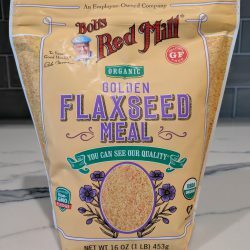 Flaxeed meal can be found at any local supermarket and on Amazon, however, I buy it at Big Lots! They sell a variety of Bob’s Red Mill products. You heard it here first folks! This recipe is great on the go. Pack it in a closed container to eat at work or while waiting at the dentist office! It smells delicious so you won’t offend anyone! 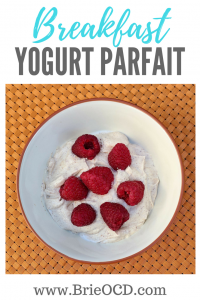 Delicious yogurt concoction packed with Protein! add yogurt, almond butter, ground flax seed meal and agave to the bowl. ooh nice touch!! I’ll have to try that one day!